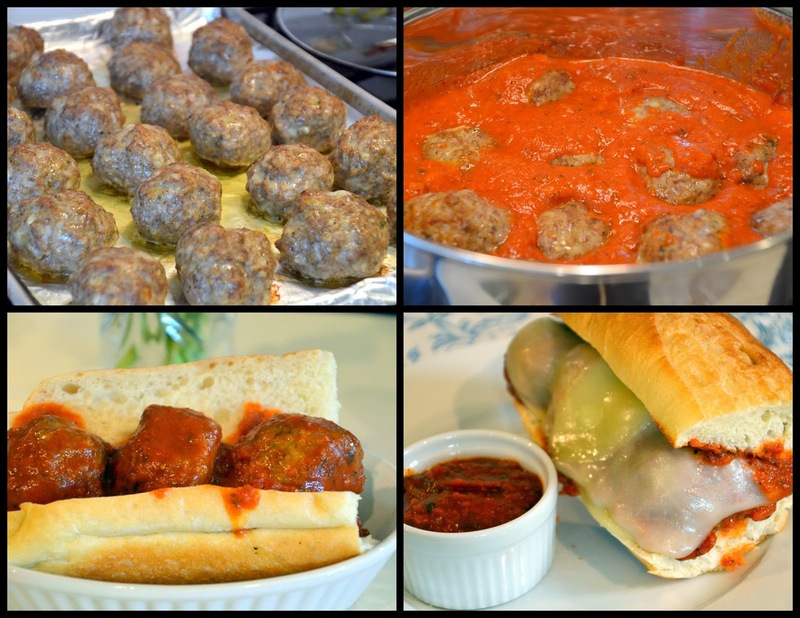 Making your own meatballs is easy to do and they are delicious and good to use for a sandwich or in spaghetti and meatballs. Once the sandwich is assembled you can put it in a toaster oven to melt the cheese of your choice on top of the meatballs. My family gave these meatballs a thumbs up! When mixed well form meatballs using a 1/4 cup measure to scoop up meat to make uniform meatballs. I found it helpful again to rub my hands with oil before forming the meatballs. Place the meatballs on large cooking sheet lined with foil. When five minutes are left on the cooking time heat up the marinara or spaghetti sauce in a large saucepan. When meatballs are removed from oven place 12 of them into the sauce and let them simmer while preparing the rolls for sandwiches. Put 3 meatballs on each roll and pour a little more sauce over the meatballs. If you like place 2 slices of cheese on the meatballs and heat under broiler or in toaster oven till the cheese melts. You can also cut the meatballs in half before putting them on the rolls. The 12 meatballs will make at least 4 sandwiches and for smaller appetites using 2 meatballs you can yield 8 sandwiches. You can freeze the remaining meatballs to use later in another dish or sandwiches. If I were cooking these days, I'm not, I'd be highly tempted by these, but then the Subway ones are very good, too. Yum! I just bought a box of frozen meatballs. I should try to make them next time - you make it sound so easy. Hi Ellen, this looks sooooooo delicious!!! My hubby's favorite kind of meal. I am going to make it for him the first opportunity I get.